The Sancho Panza Belicosos is a smooth and tasty medium-full bodied Pyramid, 5.5” (140mm) long, of 52 ring gauge, and comes in a 25 cigars box. Sancha Panza, an old Habanos brand whereas not being the most famous, is known for several great vitolas , such as the Belicosos and the Molinos that were very popular one century ago. Thankfully, the Belicosos is still around and available. It is a praised cigar among aficionados of Habanos. 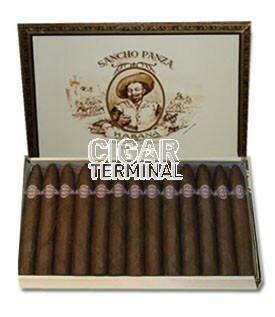 Unlike other Torpedos, the Sancho Panza Belicosos not too strong and yet has the distinctive Sancho Panza taste. It is never too aggressive on the palate. • Full of earthy and woodsy flavors. While it is providing mellow woodsy and earthy flavors it has a great potential for aging that can strengthen its somewhat mild body. The Sancho Panza Belicosos is a good looking cigar. The wrapper is oily and has a nice colorado color, few veins are visible; it is not perfect but very nice looking nonetheless. 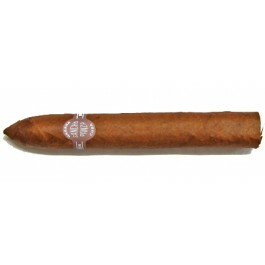 The Sancho Panza band is quite simple looking and humble, somehow in the brownish tones of Montecristo band. The pre-light draw is easy and gives scents of wood, earth and tea. There is also a good amount of pepper and salt on the lips and we can detect slight flavors of honey and cinnamon. The draw of the Belicosos is great, not too tight not too loose. And the burn line is flawless. A nice grey ash is generated by the cigar, holding on even past one inch. A beautiful white and thick smoke gets released. When lightning up the cigar, the first flavors that come to the mouth are of caramel with just enough spiciness of black pepper. At first the cigar reveals a medium to strong body, but soon after, the cigar mellows down and the flavor profile evolves to more woodsy and herbal aromas. Deep flavor of earth are slowly appearing and soon becoming dominant, with the wood in the background. The cigar continues to gets smoother while some notes of roasted coffee make way to the foreground. In the second third, the cigar becomes even better. The flavor profile remains basically the same, just with more strength than in the first third. The middle section of the cigar is just amazing. In the last third of the cigar, the cigar strength goes up a notch, now being a closer to a full bodied cigar. Flavors of wood are still dominant; however, some nutty and chocolate notes are being picked up. In summary, the Sancho Panza Belicosos is a great cigar, so enjoyable, especially in the middle third. The fact that it is delivering lots of flavors while never being too aggressive makes it a great afternoon cigar. It also has a great potential for aging.